My goodness, loves. I'm overwhelmed by your encouraging pep talks regarding my decision to move. Thank you so much for helping me weigh the pros and cons. It's the end of the year, so I'm a bit sentimental. But it's so comforting to know that if I ask for advice, you'll be there. You are amazing. DIY party supplies for NYE. Hello melodica. I want you! What a perfect winter meal. New Year's party in a box. The Olsen twins have another sister?? How to cut down on holiday waste. New Year decor that stays up all year. Make some non-goals for 2011. A pretty porcelain log lamp. OMG friends! Should I move into this adorable little cottage? Hal and I toured it on a whim a few weeks ago. It's vintage quaint and quirky... just our style. There's a wood-burning fireplace, 3 small bedrooms, with a workshop / art studio out back. A few other couples handed in rental applications before us, so we put it out of our minds. But the landlord just called me saying the house is ours for the taking! I'm torn. It's a $1,000/month house... unheard of in Seattle, and $100 cheaper than our current 1-bedroom condo, so we'd save money. But the bathroom is tiny. I mean sitting on the toilet and tall people's knees hit the wall tiny. Our furniture might not fit because old houses don't exactly have open layouts. And it would kill our houseboat dream. Eek! What to do? P.S. And yes, that is a blow-up palm tree near the porch and a pink plastic flamingo in the front garden. There are so many summer engagement photos, it's refreshing to see some love in the snow. On the slopes! Which is ultimate romance. Emily took snowboarders, Laura & Mitch and skiiers, Shauna & Travis up into the Afton Alps to photograph their love for the mountains and each other. Makes me want to hit the slopes with my honey! I'm re-evaluating my life for the New Year. This helps! The Tattoo House in Australia was designed with tree silhouette decals over the windows for privacy and shade. How imaginative! They were made using photographs of real local park trees which saved the homeowners the expense of importing fully-grown trees to the site. The shadows are so realistic, don't you think? Perfect for window walls and glass homes. I would love these goal and wish clipboards for the New Year. Although my goals and wishes are usually one and the same. Have you come up with any 2011 resolutions yet? The pet cat got a pet bird for Christmas. It's plush with a red breast, green wings, and real feathers. It sings a little song when pawed. I know Bailey loves it because the chirping invaded my dreams last night. Guess it's time to take the battery out. Have you heard of these new cameras? The Flutter In Pinhole is a geniusly designed piece of cardboard that folds into an instant Polaroid-style camera. After your photos are taken, it then unfolds into a postcard to write on and pop in the mail. So you can easily send your world travel photos to friends and family back home. Such a novel idea. How was your hoilday weekend? I'm back from my family's trip to Edgefield. We had such a wonderful time. I have to admit, it was a bit strange not celebrating Christmas at my parent's house, which I've done every single year of my life. But it was fun to shake things up a bit. The highlight for me was the outdoor soaking pools (man-made hot springs). One night, Hal and I decided to take a dip during a rain storm. We threw on our suits, robes, and flippy floppies. Ran outside in the freezing cold. Got lost. Cursed and giggled hysterically at our stupidity. And finally found the heavenly pools. We immersed ourselves into hot steamy bliss, and for awhile, we were the only ones there. It felt so amazing to have icy droplets pound down on our heads while being toasty warm under the surface. Have you ever experienced a soaking pool... in the rain? If you celebrate Christmas and are looking for some new holiday tunage, I came across this free digital album full of indie artists you might not have heard of before. It's pretty fun and eclectic! You can download it here. Enjoy, darlings! Tiny wine cork trees and reindeers. Imagine spending Christmas in a fairy tale house. Need to get into the spirit of the season? Mailing holiday cards late? Use chocolate postage stamps! A nice post-Christmas detox salad. Send your loved ones a personal video message from Santa himself. 24 ways to display your holiday cards. Have you ever had a Austrian linzer cookie? I'll be wrapping a few white elephant gifts tonight and since they're only worth around $10 each, they'd better have some pretty packaging! Now, I'm embarrassed to admit, I have a ton of Trader Joe's paper bags shoved under my kitchen sink, yet never noticed their delightful holiday designs. Both Merrilee and Leslie put them to good use and made the loveliest gift wrap. Bravo ladies. And bravo Trader Joe's. I'm off to get me some festive string! The house I rented for my birthday bash in Palm Springs had a sputnik chandelier, and I've been craving all things sputnik ever since. Dabito figured out how to make one out of an inexpensive satellite hanging photo clip. Just afix mini ball ornaments and boom. Instant mid-century goodness right there. P.S. He also made a Polaroid sputnik mobile! Everyone loves a mix tape, right? If you're looking for a great last minute gift or stocking stuffer, Jen of PepperSprouts designed this lovely template for us to download, print, cut and fold into a CD sleeve. I should give them to my family for our Christmas drive down to Oregon! Holy yum. Danielle's grown-up version of Nutella uses a pinch of ground espresso and replaces cocoa powder with intensely-flavored roasted Cacao nibs to add crunch and a layer of smokiness. What an excellent homemade gift, right? They call her Zen. Photographer, Paul de Luna, captures her name's essence in the most beautiful way. I can see the moon from my living room sofa and I'm all settled in to watch the historic eclipse tonight. Did you know it's the first winter solstice lunar eclipse in 372 years? NASA cannot even predict when the next one will occur. So night owls, get your cameras ready. Peak viewing time in the States is 3:17 am EST and 12:17 am PST. Let me know if you were able to see it! It's so exciting to find a place you'd like to visit and later realize it's within driving distance. These minimalistic rolling huts are in Washington’s Methow Valley, only 4 hours from Seattle. They were designed by local Olson Kundig Architects to similate Thoreau’s simple cabin in the woods, in that structures take second place to nature. My fingers are little icicles and I'm wishing I had these wool hand warmers. If you sew, you can DIY them using old sweaters or cozy wool from Three Sheep Studio. Aren't they sweet? Thank you for all your healing vibes this weekend. Unfortunately, I have laryngitis and sound like a muppet. This is not ideal for a singer. Hoping and praying I will get better before Christmas Eve this Friday! I'm trying really hard to make my weekend a happy one, since I've fallen ill and had to cancel all my holiday plans. Right now, I'm in bed writing my first-ever Saturday post. I've got my laptop, a hot cup of Theraflu, a sympathetic kitty, a good book, and plenty of dvds to keep me occupied. Hibernation does a body good. Pretty packaging for your presents. Create your own snowflake online. Imagine having this view from you living room. "Because winter bicycling will change your life. You will better appreciate the differences between summer and winter cycling (for example, not smelling like B.O). You will feel the yin, the yang, etc. By season’s end, you will shed grateful tears over the first buds of spring, the first delicate bird's nest. Also, for hot legs. Obviously." Okay, I'm convinced! Where's my bike? For my fellow felt junkies, Kathleen put together a Five Days of Felt showcase for the holidays. I'm loving the pine cones. Happy crafting! La Parisienne: Madagascar vanilla bean pieces + dark chocolate. Bianca: Australian lemon myrtle + lavender flowers + vanilla + white chocolate. Aztec Elixir: Ancho & chipotle chillies + Ceylon cinnamon + Madagascar vanilla bean + cornmeal + dark chocolate. I think I'm ready for big girl cocoa! The real Venice is my favorite city in Italy. The other Venice is my favorite neighborhood in LA. And the fake Venice is my favorite hotel in Vegas. I guess I have a thing for gondolas. The last time Hal and I were in Sin City, my only goal was a romantic ride through the canals. I mean, it's almost like the real thing. Almost. We had just gotten out of The Strokes concert and Hal carried me piggyback (my shoes were killing me), racing through The Strip to make it to the gondolas on time. We missed it by mere moments. I can't remember the last time I made a gingerbread house. Maybe 3rd grade? Mine were never as inventive as these, however. Or the architectural ones I featured last year. When was the last time you got gingerbread crafty? Here she is! Hal's Lola. Isn't she beautiful? I have to say, it was pretty emotional celebrating her 100th. They showed a slide show of her life. She grew up in the Philippines and had 6 children, all of whom had many more children, some of whom had even more children. She was so happy and healthy. She even did the money dance! Bring it on, 2079. I'm ready for ya! This might sound crazy to some of you, but when I was a wee one, my mom had my birth chart extensively read by a Vedic astrologer. Reviewing it as an adult, I've found it to be eerily accurate. The descriptions of my personality, emotional disposition and natural talents were right on. Wouldn't you love to know what your birth chart looks like? Star Arc will turn yours into a modern graphic print based on the geometry of your astrological aspect pattern. Each one is perfectly unique according to the placement of the planets when you were born. Oh dear. I'm still in travel mode. Somebody please restrain me from booking flights to the Swiss Alps right this instant! Whitepod is an eco resort & spa located in the village of Les Cerniers. I can't imagine anything more romantic and cozy than glamping with your honey in ski-in/ski-out igloos, can you? I can't wait to share a few photos and stories with you! A library Christmas tree made of books. Love shoes, but don't have a closet? Win a set of 3 custom city map prints. DIY ornaments for the modern tree. The cutest printable owl gift wrap. Moths have only been an annoyance for me and an amusement for Bailey. I've never thought they were beautiful, until now. Rivaling their butterfly siblings, don't you think? Allyson Reynolds paints them to perfection. I've been feverishly daydreaming about life on a houseboat. Hal and I are considering a move, and it's always been a dream of ours to live on a floating home for once in our lives. A houseboat like this modern one docked on Lake Union in Seattle is extremely enticing. Enrico and Yumiko did an amazing job with the renovations, turning it into a little zen oasis on the water. We're even looking into an older liveaboard yacht, where we can cruise around, drop anchor, and entertain in the middle of the Puget Sound. If Julie and Soeren can do it, we can too, right? Would you ever live on a houseboat? Isn't this a fun little project to make for parties this holiday? Stuff some clear globes with cocoa mix, crushed candy canes, mini marshmallows and a festive straw. Just add hot water and guests can sip peppermint hot chocolate directly from the ornaments. P.S. These remind me of those sphere shaped tumblers that roll around on the table, but will never spill your drink. They're incredibly cool. I drank out of one at a bar once, but can't find them anywhere. Has anyone seen them online? I just love what Valerie and Camilla did to jazz up this ordinary vintage-inspired lace dress that cost $248 from Free People. They simply took out the lining and replaced it with a short gold sequined slip for some sparkle underneath. Wouldn't it make such a sweet and unique wedding gown? Bravo if you knew what a "dress boy" was. If you're in the dark like I was, allow me enlighten you! It's a half chair affixed to the wall for you to drape your clothes over. Learn how to make them here. I need a dress boy for my mess man, since his entire wardrobe is on the floor! I'm a late discoverer of Carla Bruni's music. You may have heard "Quelqu'un M'a Dit" from 500 Days of Summer. This song is from her debut self-titled album from 2002, six years before becoming the "First Lady of France" and marrying the French President, Nicolas Sarkozy. Formally an Italian supermodel, I'm extremely impressed with her singing and songwriting talents. I don't speak French, but I don't think I need to know what she's saying. 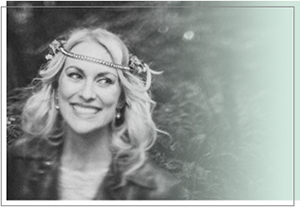 Her intimate vocals and soft bluesy folk guitar arrangements say it all. Whew. I just trudged through a torrential rain storm on my way to the bus this morning. I stepped out the door, saw a flash of lightning, heard an immediate boom of thunder, and knew I was in for a wild ride. The wind blew my umbrella inside out. And I'm soaked to the bone. Butch Anthony built and designed this incredible salvaged pine log cabin to house his family and friends during the annual Doo Nanny, a "micro" folk-art festival, similar to Burning Man. For the past 3 years, it has been held on his property, an 80-acre family compound in the Alabama woods. Pretty rad, right? And so is the word, Doo Nanny! I am so impressed with the level of talent on The Sing-Off this season. Did you happen to catch the premiere last night? A cappella groups weren't exactly cool when I was doing it. But now it's the hot new thing. What's the deal? Have you ever had a raclette party? Oh my goodness friends, if you have not, I highly encourage you to do so! This weekend, we fired up the raclette grill and went to town. If you're unfamiliar, raclette is a type of cheese. A very stinky cheese. The raclette party concept originated in the Swiss Alps and is fairly popular in Europe, but not so much here in the States. It's all about melting cheese over veggies and meats (faux meats in my case) on a specialized grill. We went a little bit traditional, a little bit not: boiled fingerling potatoes, dill gherkins, balsamic onions, soy salami and sausage, pickled spicy mushrooms, baby heirloom tomatoes, broccoli and cauliflower florets, with choice of raclette, gouda or emmental cheese, sprinkled with fresh ground pepper and chives. P.S. Don't forget to enter the gorgeous jewelry giveaway by Anne Maa Designs... tonight is your last chance! 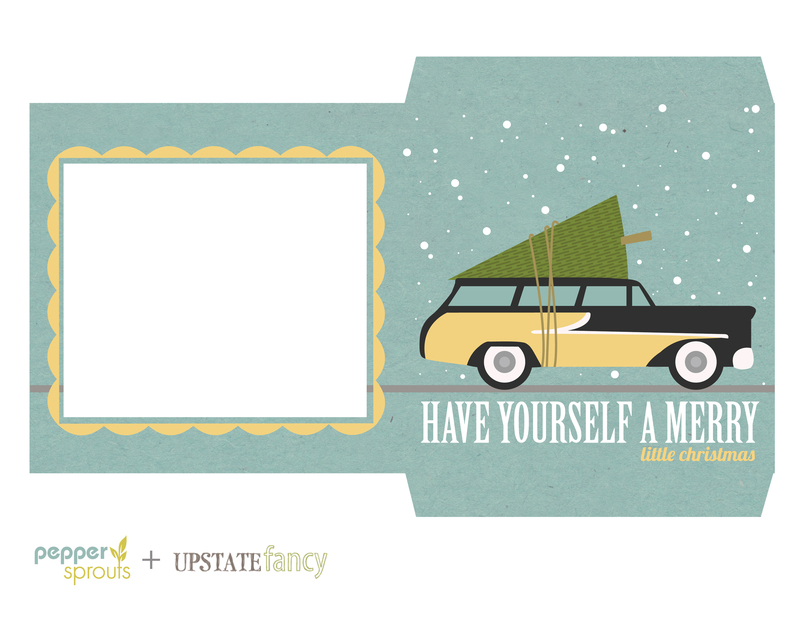 Thank you Amy for creating these free downloadable holiday gift tags for us! Aren't they sweet? Do you rememember the childhood game, where one person starts writing a story and passes it to the next person to continue it, and so on? The Exquisite Book was based off that exercise and was passed around between 100 contributing artists, illustrators and designers. How fun! I love collaborative projects like this. Which by the way, our Collaborative Sketchbook Project is in its final phases. There are 16 talented blogger/artists who are participating and I'm starting to receive everyone's beautiful work. I can't wait to share the final book with you! I'm throwing a little raclette party tomorrow to celebrate the season and admire the freshly decorated Christmas tree. There will be plenty of oozing cheese, games by the fire, and perhaps a holiday craft or two. Turn an ordinary ladder into a Christmas tree. I'd like to hang this print in my kitchen. An old sweater becomes a pet bed. A great way to hide your television. Box wine fans might like disposable flasks. The most genius staircase ever built. How to make a wine cork wreath. Lina Jaros has an eye for fantasy. These surreal images are from her "Beyond The Walls" series, which she describes as "environmental distortions of everyday surroundings". Don't you want to jump into her photographs and play house? I'll be the girl. You can be the boy. I'm putting up the tree this weekend and making it pretty! We have a faux kitchy white one that suits my style perfectly. Don't have too many ornaments yet beyond the retro mini-bulbs, dried orange and lime slices and Star of David topper (happy Hanukkah yo!). I think these adorable little critters should make their home in my tree. They're all-natural, made from bark, pine cones, leaves, pods & seeds!